If one is to follow the morning and evening church services of Holy Week, it soon becomes evident why that week is referred to in Greek as “Long, or Large Week” («Μεγάλη Εβδομάδα.») These services, commencing with the resurrection of Lazarus and Christ’s entry into Jerusalem, take us through the suffering of Christ, linking prophecy with its fulfillment, through the use of some of the most beautiful, compelling imagery and poetry ever to have been written in the Greek language, only to have us arrive at the remarkable Resurrection. The entire Christian confession is contained in the words “Christ is Risen.” The Apostle Paul, referring to this fact, clearly and emphatically says: “If Christ has not been raised, then our preaching is in vain and your faith is in vain” in his epistle to the Corinthians. 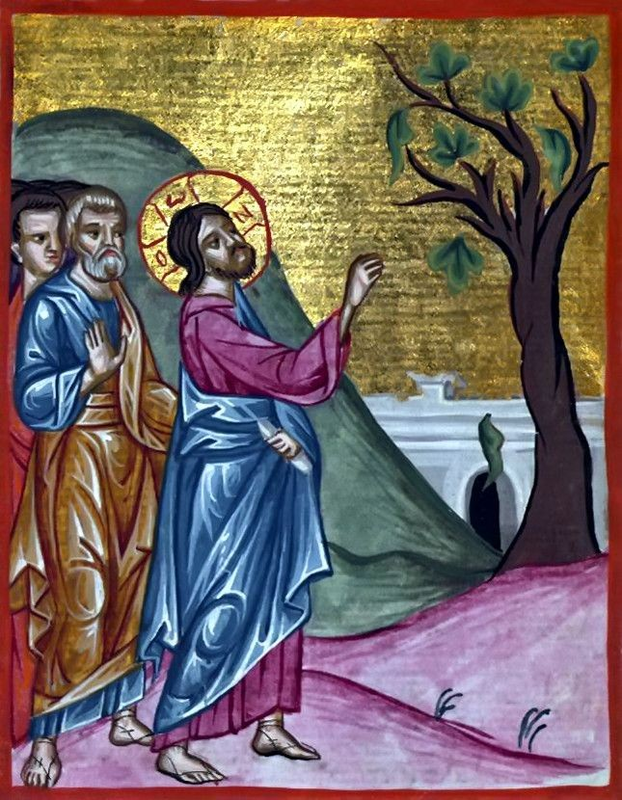 The Holy Monday service (sung Sunday night) commemorates the fig tree which was cursed and withered by Jesus. The withering of the fig tree was a miracle of special symbolism, since the tree had leaves, but no fruit, a post-modern reference to those who claim ethical and religious identity, but who in reality have empty lives that yield no fruit. On that evening, the passionate Hymn of the Bridegroom, is sung: “Behold the Bridegroom comes in the midst of the night… beware, therefore, O my soul, lest thou be borne down in sleep….. and lest thou be shut out from the Kingdom . . .” The canticle hymn also has a symbolic exhortation: “I see thy bridal hall adorned, O my Savior, and I have no wedding garment. . . O giver of Light, make radiant the vesture of my soul and save me”. At this time the solemn procession of the Icon of Christ-Bridegroom takes place around the church. The people, anticipating the sufferings of Christ, sing: “Thy sublime sufferings, on this day, shine upon the world as a light of salvation”. Holy Tuesday commemorates the parable of the Ten Virgins in the Gospel of Matthew, where Jesus stressed the importance of ethical preparation and wakefulness. 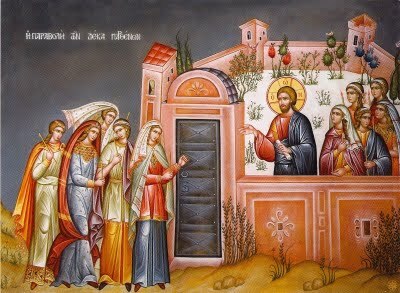 The parable of the Ten Virgins is developed around the theme of the Bridegroom: “Why are Thou heedless, O my soul? . . . Work most diligently with the talent which has been confided to thee; both watch and pray”. 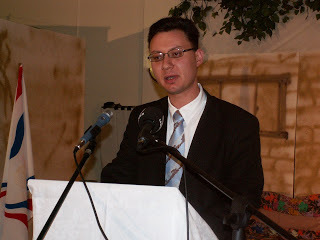 The hymnologist reminds us, “I do not possess a torch aflame with virtue, and the foolish virgin I imitate when it is the time for action”; and, “Into the splendor of thy saints, how can I, who am unholy, enter?” The exhortation is then given: “Come Ye faithful, let us work earnestly for the Master . . . increase our talent of grace … Wisdom through good works”. On Wednesday (Tuesday night) commemoration is made of the anointing of Christ with myrrh by the woman in the house of Simon the leper, in Bethany. On this evening, the powerful “Hymn of Cassiane”, probably a work of Patriarch Photius is sung. It begins: “The woman who had fallen into many sins recognized thy Godhead, O Lord; Woe to me, saith she; receive the sources of my tears, O Thou who doth gather into clouds the water of the sea. Who can trace out the multitude of my sins and the abysses of my misdeeds? “O Thou whose mercy is unbounded”. On Holy Thursday Evening, the Passion of Chris is remembered and re-enacted. This service is long, but its content is dramatic and deeply moving for the devout Christian. Participation in the prayers and the historical sequence of the events, as related in Twelve Gospel readings and hymns, provides a vivid foundation for the great events yet to come. After the reading of the fifth Gospel, the Crucifix is processed around the church, while the priest chants the 15th antiphon: “Today is hung upon the Tree, He Who did hang the land in the midst of the waters. A Crown of thorns crowns Him Who is King of Angels. He is wrapped about with the purple of mockery Who wrapped the Heavens with clouds. He received buffetings Who freed Adam in Jordan. He was transfixed with nails Who is the Bridegroom of the Church. He was pierced with a spear Who is the Son of the Virgin. We worship Thy Passion, O Christ. Show also unto us thy glorious Resurrection”. According to Hebrew custom, the “Royal Hours”, four in number, are read Good Friday morning. These services consist of hymns, psalms, and readings from the Old and New Testaments, all related prophetically to the Person of Christ. The Vespers of Friday afternoon are a continuation of the Hours. During this service, the removal of the Body of Christ from the Cross is commemorated with a sense of mourning for the terrible events which took place. Excerpts from the Old Testament are read together with hymns, and again the entire story is related. The Apostle Paul, interpreting the dreadful event, exhorts the Church: “For the word of the cross is folly to those who are perishing, but to us who are being saved it is the power of God . . . we preach Christ crucified . . . the power of God and the wisdom of God”, As the priest reads the Gospel, “and taking the body, Joseph wrapped it in a white cloth”, he removes the Body of Christ from the Cross, wraps it in a white cloth and takes it to the altar. 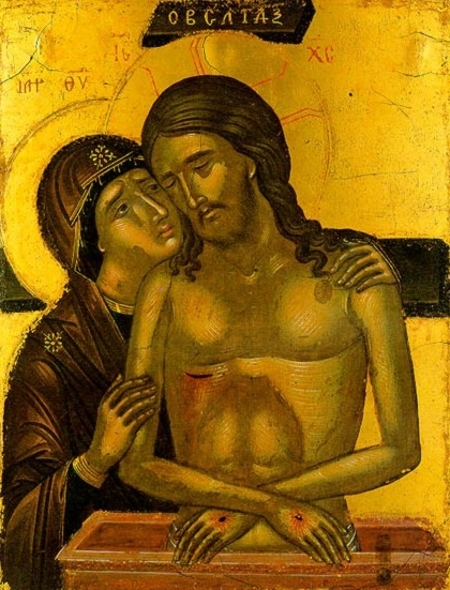 The priest then chants a mourning hymn: “When Joseph of Arimathea took Thee, the life of all, down from the Tree dead, he buried Thee with myrrh and fine linen . . . rejoicing. Glory to Thy humiliation, O Master, who clothest Thyself with light as it were with a garment”. The priest then carries the cloth to the Epitaphios. Perhaps the most famous and best attended Holy Week service is the Good Friday Evening Lamentation. It consists of psalms, hymns and readings, dealing with the death of Christ and in expectation of His Resurrection. One of the hymns relates: “He who holds all things is raised up on the Cross and all creation laments to see Him hang naked on the Tree”. The profoundly moving Odes compare the compassion and might of God with the cruelty and weakness of man, portraying all Creation as trembling when witnessing its Creator hung by His own creatures: “Creation was moved . . . with intense astonishment when it beheld Thee hung in Golgotha”. 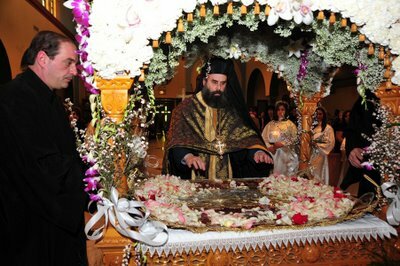 During this service the Body of Christ in the Epitaphios is carried in procession around the church andthe entire congregation joins in singing the “Encomia” After these hymns are sung, the priest sprinkles the Epitaphios and the whole congregation with fragrant water. On Holy Saturday Morning, psalms are read and Resurrection hymns are sung which tell of Christ’s descent into Hades. “Today Hades cried out groaning” is the hymn’s description of the resurrection of Adam and the conquering of death. Thus this day’s celebration is called “First Resurrection”. Most of the readings of this day are from the Old Testament on the prophesies of the conquering of death. 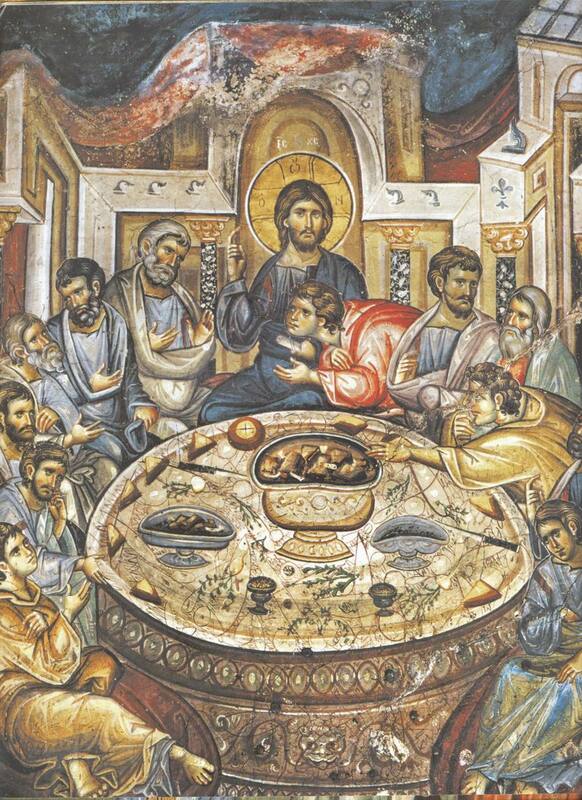 On this day the Divine Liturgy of St. Basil is officiated. 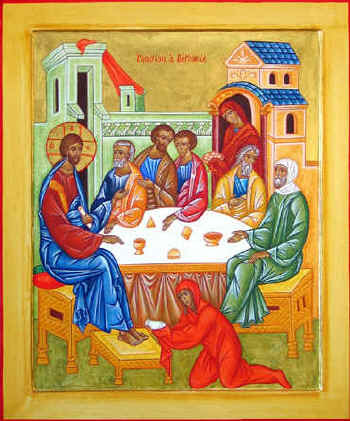 Apostle Paul exhorts the faithful: “We were buried, therefore, with him by baptism unto death, so we, too, might walk in newness of life”, After the reading of the Epistle, the priest follows the custom of tossing of laurel, saying: “Arise, O God, and judge Thou the earth: for Thou shall take all heathen to Thine inheritance”. The Cherubic hymn of this day is: “Let all mortal flesh keep silence and stand with fear and trembling……”, a thoughtful hymn of adoration and exaltation. The Divine Liturgy ends with the Communion Hymn: “So the Lord awaked as one out of sleep, and He is risen to save us”. 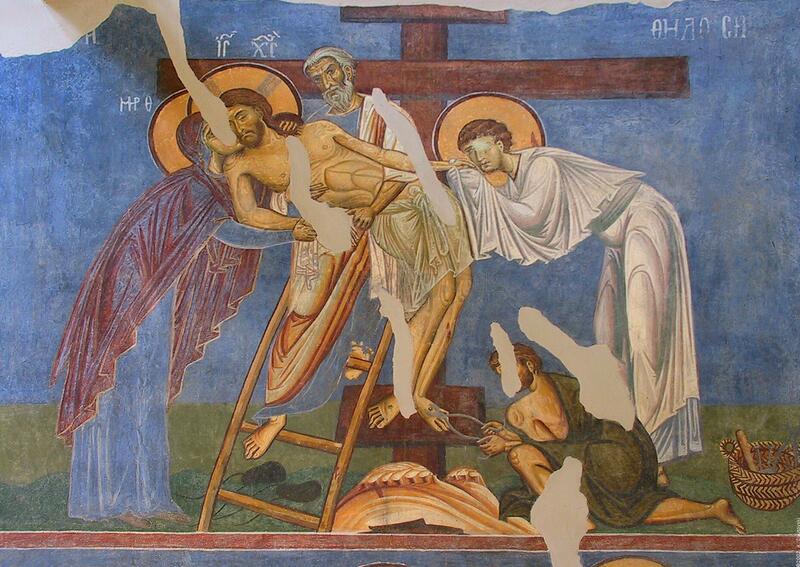 On Easter Sunday (Saturday midnight) the life-giving Resurrection of Christ is celebrated. Before midnight, the Odes of Lamentation of the previous day are repeated. The Orthros of the Resurrection begins in complete darkness. The priest takes light from the vigil light and gives it to the faithful, who are holding candles. The priest sings: “Come ye and receive light from the unwaning life, and. glorify Christ, who arose from the dead”, and all the people join him in singing this hymn again and again. From this moment, every Christian holds the Easter candle as a symbol of his vivid, deep faith in the Resurrection of Jesus The priest leads the people outside the church, where he reads the Gospel which refers to the Angels statement: “He is Risen; He is not here.” Then comes the breathless moment as the people wait for the priest to start the hymn of Resurrection, which they join him in singing, repeatedly: “Christ has Risen from the dead, by death trampling upon Death, and has bestowed life upon those in the tombs”. From this moment the entire service takes on a joyous Easter atmosphere. The hymns of the Odes and Praises of Resurrection which follow are unparalleled in intensity. The people confess, “It is the Day of Resurrection, let us be glorious, let us embrace one another and speak to those that hate us; let us forgive all things and so let us cry, Christ has arisen from the dead”. The Divine Liturgy of St. John Chrysostom is then officiated. At the end of the Liturgy, a part of the marvelous festival sermon of St. Chrysostom is read, which calls upon the people to “Take part in this fair and radiant festival. Let no one be fearful of death, for the death of the Savior has set us free . . . O Death, where is thy sting? O Hades, where is Thy victory? Christ is Risen and Thou art overthrown. To Him be glory and power from all ages to all ages”. 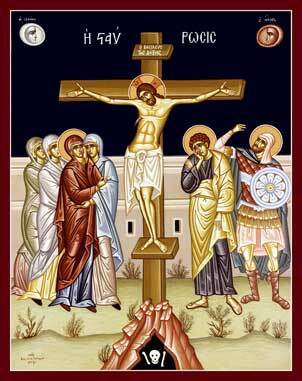 From the Diatribe, have a holy, Holy Week and ΚΑΛΗ ΑΝΑΣΤΑΣΗ.